This volume of our Journal is humbly dedicated to the memory of our colleague and friend Lic. Guillermo Armando Verazay (1953-2007), a researcher from INIDEP, Argentina, and also Dr. Ransom Myers (1952-2007), from Dalhousie University, Canada, whose work inspires us. Cantagallo, C., Milanelli, J. C. C. & Dias-Brito, D. Limpeza de ambientes costeiros brasileiros contaminados por petr�leo: uma revis�o. Pan-American Journal of Aquatic Sciences, 2(1): 1-12. Download PDF file (158 Kb). Calliari, D. Short-term changes in the concentration and vertical distribution of chlorophyll and in the structure of the microplankton assemblage due to a storm. Pan-American Journal of Aquatic Sciences, 2(1): 13-22. Download PDF file (201 Kb). Silva Jr., L. C., Andrade, A. C., Andrade-Tubino, M. F. & Vianna, M. Reversal and ambicoloration in two flounder species (Paralichthyidae, Pleuronectiformes). Pan-American Journal of Aquatic Sciences, 2(1): 23-26. Download PDF file (119 Kb). F�lix, F. C., Spach, H. L., Moro, P. S., Schwarz Jr., R., Santos, C., Hackradt, C. W. & Hostim-Silva, M. Utilization patterns of surf zone inhabiting fish from beaches in Southern Brazil. Pan-American Journal of Aquatic Sciences, 2(1): 27-39. Download PDF file (568 Kb). Mai, A. C. G., Garcia, A. M., Vieira, J. P. & Mai, M. G. Reproductive aspects of the one-sided livebearer Jenynsia multidentata (Jenyns, 1842) (Cyprinodontiformes) in the Patos Lagoon estuary, Brazil. Pan-American Journal of Aquatic Sciences, 2(1): 40-46. Download PDF file (344 Kb). Castello, J. P. Gest�o sustent�vel dos recursos pesqueiros, isto � realmente poss�vel?. Pan-American Journal of Aquatic Sciences, 2(1): 47-52. Download PDF file (53 Kb). Rincon, G. A record of abortion in the school shark Galeorhinus galeus (Carcharhiniformes, Triakidae) captured on the continental shelf off southern Brazil. Pan-American Journal of Aquatic Sciences, 2(1): 53-54. Download PDF file (30 Kb). Galves, W., Jerep, F. C. & Shibatta, O. A. Estudo da condi��o ambiental pelo levantamento da macrofauna de tr�s riachos na regi�o do Parque Estadual Mata dos Godoy (PEMG), Londrina, PR, Brasil. Pan-American Journal of Aquatic Sciences, 2(1): 55-65. Download PDF file (314 Kb). Schroeder, F. A. & Castello, J. P. �Cardume associado�: Nova modalidade de pesca de atuns no sul do Brasil - Descri��o e compara��o. Pan-American Journal of Aquatic Sciences, 2(1): 66-74. Download PDF file (301 Kb). Andrade, A. B. Echeneis naucrates (Linnaeus) (Perciformes, Echeneidae), unusual interaction with a diver. 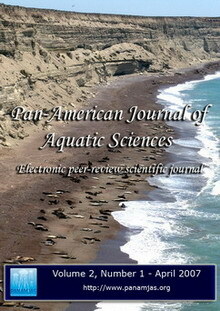 Pan-American Journal of Aquatic Sciences, 2(1): I. Download PDF file (48 Kb). Nunes, J. A. C. C. & Sampaio, C. L. S. Notes on the ecology of the poorly known Brownstriped grunt, Anisotremus moricandi (Ranzani, 1842), in the coastal reefs of the Northeastern region of Brazil. Pan-American Journal of Aquatic Sciences, 2(1): II. Download PDF file (106 Kb). Menafra, R., Rodr�guez-Gallego, L., Scarabino, F. & Conde, D. (Eds.). 2006. Bases para la conservaci�n y el manejo de la costa uruguaya. Book Review. Pan-American Journal of Aquatic Sciences, 2(1): III. (see HTML).